The finest cinematic version of Victor Hugo's novel? Claude Lelouch's audacious and brilliant 1995 adaptation of Hugo's novel is set in France during the first half of the 20th century. It adds new characters, and incorporates events such as the two world wars, the Nazi Occupation of France, the Holocaust and the Resistance, while remaining true to the spirit and scope of the novel. A good man struggling against oppression and injustice - Lelouch's Henri Fortin embodies the defiant spirit of Jean Valjean in the 20th Century. Lelouch first became acquainted with Hugo's novel in 1942, when he was only five yearsl old. 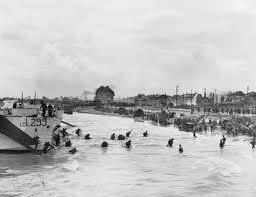 His mother was trying to escape with her son from that section of France under German control, using forged papers. In order to pass through a border crossing, his mother had to bribe an official with a gold watch. "What a Thénardier he is!" she said once the pair had reached safety. (In the novel, the Thénadiers are the vicious and greedy innkeepers who mistreat and exploit Cosette). Lelouch's mother told the story of Les Misérables to her son. told the story of Valjean, Thénardier, Javert....."
In his novel, Hugo weaves the battle of Waterloo (1815) into his convoluted plot. Illustration of a meeting of the ABC society, an anti-monarchist group which plays an important part in the novel's portrayal of revolutionary events during 1830-32. 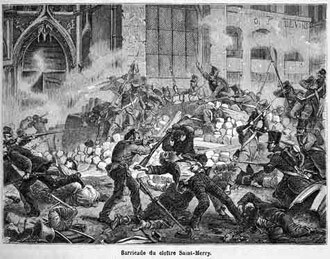 Illustration of scene during the unsuccessful Paris uprising of 1832, a crucial event in the novel, movie adaptations and the stage musical. Drawing of prisoners in the notorious Bagne of Toulon, where Valjean was imprisoned. 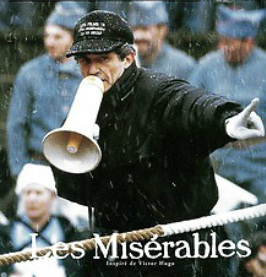 Deeply moving without being sentimental, incisively conveying Victor Hugo's universal themes of redemption, toleration and compassion without being sanctimonious, French director Claude Lelouch's version of Les Misérables takes great risks. • He shifts the setting from France in the first half of the 19th Century to France during the first half of the 20th Century. • The great dramatic historical events that give the novel its heft, such as the Napoleonic Wars, crime and punishment in early 19th century France and the 1832 Paris revolt are replaced by the fall of France in 1940, D-Day, the Holocaust and Occupation and the Resistance. • The famous characters of the novel are replaced or subsumed by new characters, created by Lelouch. • The film's hero is not Jean Valjean. Instead it is Henri Fortin, orphaned son of a chaffeur imprisoned for a murder he didn't commit. Fortin becomes a boxer and then owns a moving company. Fortin tries to help a Jewish family, Elisa and Henri Ziman and their daughter Salomé, escape the round-up of French Jews. • He includes a 1930s film version of Les Misérables, within his own cinematic adaptation. Several Lalouch's characters watch this version shown on an improvised screen. And one of the film's key characters, Andre Ziman, meets his future wife when she is performing in a ballet version of the novel. • Lelouch depicts some French as being willing accomplices of the Nazis in sending French Jews to the German death camps. 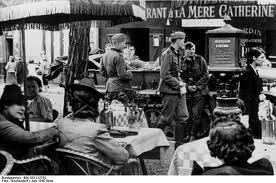 • He also shows how some French joined the Resistance for perosnal advantage. • vibrant characters who exemplified various aspects, good and bad, of contemporary life. Lelouch's movie incorporates references to longstanding French anti-semtism as a crucial part of his plot and theme. The flight of refugees during the fall of France is also an integral part of Lelouch's movie. Lelouch's movie casts a sardonic eye on how most French people accepted and some even collaborated with - the German ocupation. 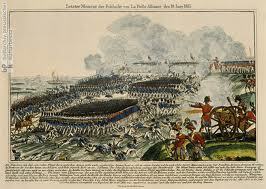 Whereas Hugo used the Napoleonic as an historical backdrop, Lelouch uses World War II, including the D-Day landings, as part of the historical context of his movie. How does Lelouch update Victor Hugo's original version to twentieth century France ? Many spoilers in this section. 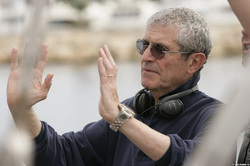 The crucial aspect of the director's appropriation of the novel involves having one actor (Jean-Paul Belmondo) play three roles, becoming the focus of three inter-related generational strands of the plot. One of the roles is that of Valjean, the key character in the novel. Another is a character introduced by Lelouch: Henri Fortin, a chaffeur in the early 1900s, who is wrongly imprisoned for a murder he didn't commit. Another 'new' character played by Belmondo is that of Fortin's son, Roger, who becomes a thief, a convict, a champion boxer, and a truck driver. Lelouch also incorporates a Fantine figure into his updated version. Named Fantine, she is Henri Fortin's widow, mother of Roger, who - in another reference to the original novel - who works for a vicious innkeeping couple, the Guillaumes (Thenardiers). They force her into prostitution in order to raise her son. Eventually she kills herself. The director also introduces a completely new family group in order to focus on two crucial but controversial features of French history in the first half of the twentieth century: anti-semitism, and French resistance to the Nazi Occupation during the second world war. This is the Ziman family, whose initial wealth and high social and cultural intellectual standing (rich lawyer André, famous ballerina wife Elise, clever daughter Salome) contrast with that of the Fortin family. But with the Occupation, the Zimans are desperately attempting to escape capture and deportation. For Lelouch, the Zimans symbolize "the misery of the twentieth century". 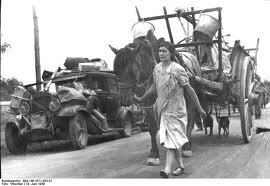 Eventually the lives of the family and the poor, but humane Roger Fortin intersect, and he carries them in his moving van in an attempt to enable them to flee to Switzerland. At this stage the film takes a remarkable turn. The nineteenth century world of Hugo's novel and the twentieth century world of Fortin and the refugee Zimans interlock. The illiterate Fortin has set one condition for helping the family: that André reads aloud to him a book he has heard about - Les Misérables. Lelouch inserts his own black and white versions of some scenes from the novel. Fortin becomes increasingly impressed by the courage and integrity of Valjean and comes to the character as a model for himself to emulate. He sees the parallels between his life and Valjean's, and gradually comes to regard himself as a twentieth century version of the nineteenth century Valjean. He also realises that the misery and oppression of Hugo's France is even worse in the twentieth century, although in different forms. From now on in the film, some of Hugo's key characters assume different identities in Lelouch's film. Javert becomes a collaborationist policeman, Fortin becomes increasingly like Valjean, the innkeeper couple the Guilaumes take on the characteristics of the Thenardiers. 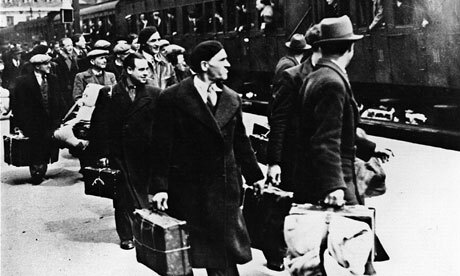 Jews being deported from Pithiviers, central France, 1941. Their destinations were the death camps of the Reich. 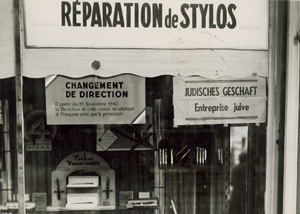 Parisian shop seized from Jewish owners and now advertised as under new ownership.- the sign on right says 'Jewish business'. Fortin helps the Zimans attempt to escape arrest while Andre Ziman reads Les Misérables to the illiterate van-driver. Roger Fortin's father is chaffeur for a rich family, but is wrongfully convicted for murder. Just as Valjean becomes the protector and mentor of Cosette, so Roger Fortin protects the Ziman's daughter. Jean-Paul Belmondo plays not only the Fortins, father and son, but also the part of Valjean in a film within a film.